Dennis Foy’s idea of a perfect meal is great friends, simple food in a relaxed atmosphere. Raised in Philadelphia, one of five children. His father was a master craftsman, who also wrote poetry. His mother a homemaker and artist. He considers himself a painter and a chef, sharing those rare talents so beautifully in another one of his masterpieces, Café Loret in Red Bank, NJ. The 66-seat restaurant is located at 128 Broad Street and Peters Place with menu offering Chef Foy’s famous specialties exciting new dishes among art-filled walls displaying colorful landscapes and moving abstract paintings. All works are Dennis Foy creations, representative of paintings he exhibits. It was 1978 that Chef Foy opened his legendary Tarragon Tree, Chatham’s ground-breaking restaurant that set a new standard for dining in New Jersey, traveling its backroads to tap local farmers for fresh, seasonal ingredients. He has trained a few generations of chefs, By 2007 Chef Foy had an eponymous restaurant in Tribeca, then two others on the Jersey Shore at Bay Head and Point Pleasant Beach. Since 2016, foodies have been flocking to d’floret, Chef Foy’s western New Jersey collaboration in bucolic Lambertville where you find him working alongside his wife and longtime business partner, Estella Quinones-Foy. 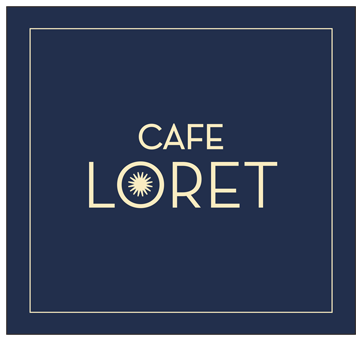 They return to the Jersey Shore opening Café Loret, presenting an amazing menu and more. The celebrated chef has won numerous Best of the Best Awards in NJ for cooking, two Best New Restaurants Awards for New York City, along with two juried Best of Show Awards for painting. He is a graduate of the University of Pennsylvania and resides in New Jersey.